This easy homemade rosemary skillet cornbread is perfect for a quick side dish at home or around the campfire. I feeeeeeeel like skillet foods are the best foods. Y’know, objectively. But the inherent joy of food in a cast iron skillet is just one of many, many reasons I’m pumped to share this easy skillet cornbread recipe with you today. 1. 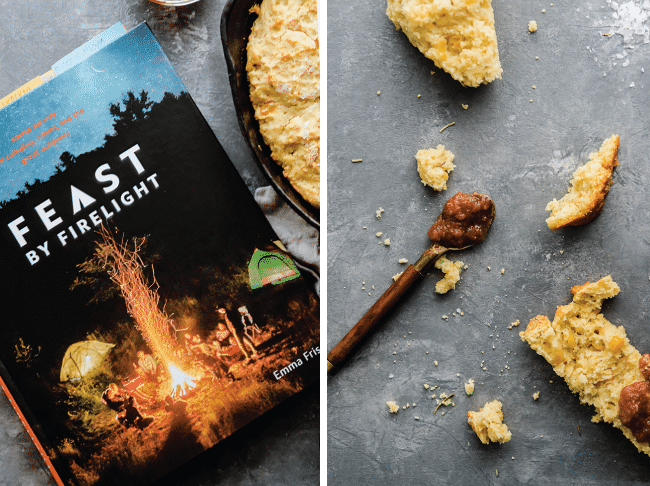 This is a recipe from my lovely friend Emma’s BRAND NEW COOKBOOK, Feast by Firelight: Simple Recipes for Camping, Cabins, and the Great Outdoors! She knocked it out of the park with this book and I am so stinkin’ proud of her I could cry. Or do a happy dance. 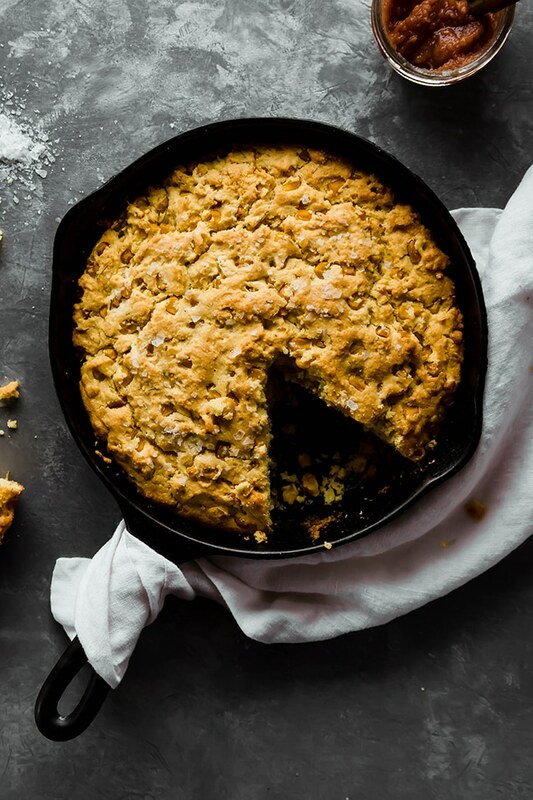 Or eat an entire skillet of this skillet cornbread. 2. This cornbread? It’s awesome. The recipe in the book was written for the great outdoors (campfire cooking ftw!) but I tweaked a few things so that I could also enjoy it inside. With heat. And sweatpants. Because it is still snowing here. 3. Skillet cornbread is SO SIMPLE. This recipe uses a can of creamed corn in lieu of milk or buttermilk which 1. Is perfect for simplifying the recipe when you’re camping and 2. 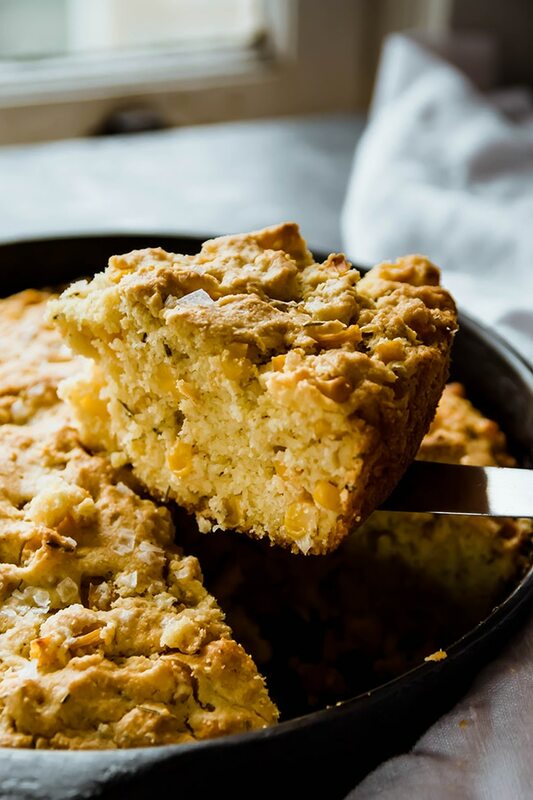 Gives the cornbread an amazing (dare I say … *moist*) texture with plenty of sweet corn kernels to keep things interesting. You can smooth out the top of the cornbread before you bake it to make it, well, smoother, or you can be lazy like me and leave it as is for a little more texture on top (RUSTIC). Also, fun fact: Emma is the latest podcast guest on At The Table! So when you’re done making this cornbread, you can pop on over here and listen to her talk about her farm-to-table work and the inspiration for Feast By Firelight. The book walks you through everything you need to know about campfire cooking. EXAMPLES: What heat sources to use, how to be environmentally friendly (woo! ), how to pack a cooler for maximum chillness (see what I did there?) and longevity, and how to prep recipes ahead of time for easy, stress-free camping. Of course, if you’re like me and not so much with the pitching-your-own-tent-and-sleeping-on-the-ground, you can always just go snag a s’more or two from Emma at Firelight Camps in upstate NY. This cast iron cornbread is great with just butter and/or honey, but you could also serve it with your favorite apple butter or a nice, hearty chili. Mix up the herbs if you don’t have rosemary on hand, and don’t be afraid to eat it straight from the skillet for maximum joy and happiness. Leftovers pair well with a fried egg, a few avocado slices, and a spoonful of salsa or hot sauce, or as the base to your favorite eggs benny. 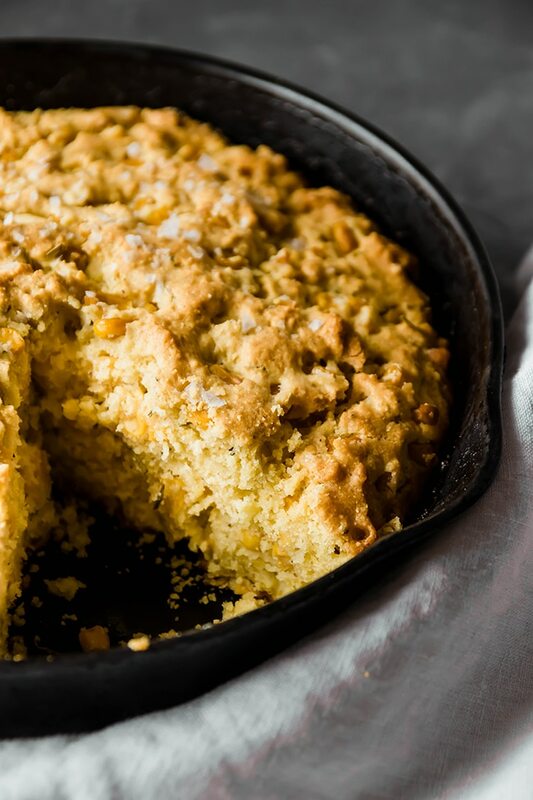 An easy homemade rosemary skillet cornbread – ready in under an hour! 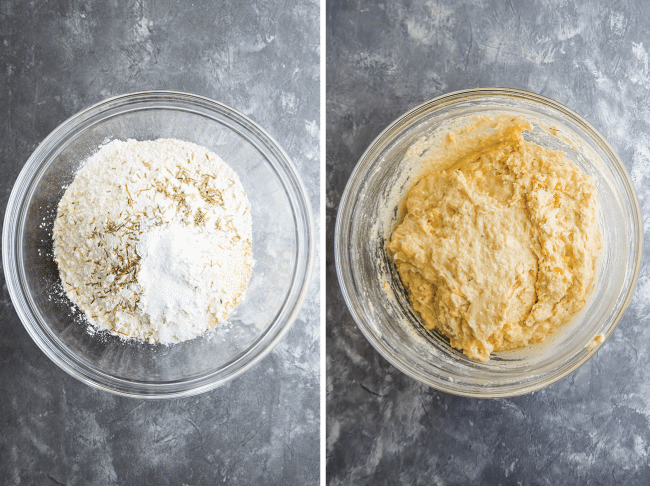 In a large mixing bowl combine cornmeal, flour, rosemary, baking powder, and salt. Stir to combine. In a separate, small mixing bowl, stir together creamed corn, melted butter, and eggs. Make sure the eggs are fully integrated into the mixture. Combine wet and dry ingredients and stir until just combined. Heat a large cast iron skillet (10-12″) on the stovetop over high heat. Add the remaining tablespoon of butter to the skillet and heat until butter has melted and begun to bubble, but not brown. 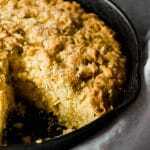 Remove skillet from heat and pour in cornbread batter. You may need to use a spatula to press the batter into the pan. Smooth the top of the cornbread with a spatula (I left mine not-quite-smooth to have a more rustic, outdoorsy feel!). Top the cornbread with a sprinkle of coarse salt (I used Maldon salt). Carefully transfer skillet to 400 degree oven. Bake for 20-30 minutes until top is very lightly browned and a cake tester inserted into the center of the cornbread comes out clean. Adapted from Dutch Oven Rosemary Sea Salt Cornbread with Hard Cider Butter from Emma Frisch’s new cookbook, Feast By Firelight, out today! For recipe instructions to make this cornbread over a campfire (and how to prep the cornbread ahead of time for camp! ), grab a copy of Feast By Firelight! Use 2 Tablespoons fresh minced rosemary in place of the dried rosemary if you prefer.